Earlier I had started a blog named Anjanaprakasini.wordpress.com, but I am not able to login now. So posting here some of the good photos and content related to the Temple in Tiru Alangadu. Adding some other photos also. 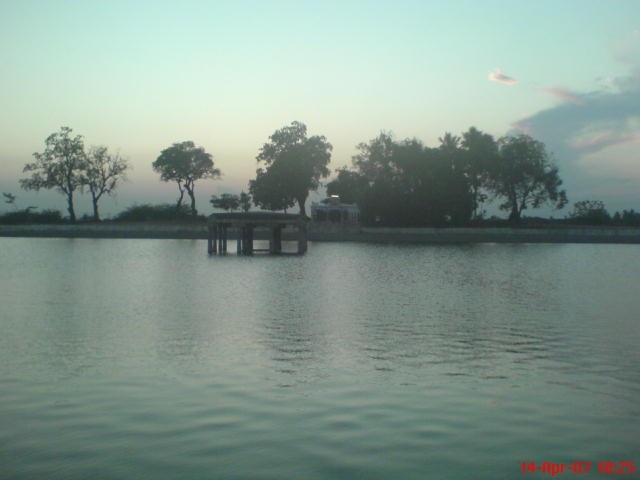 The Shiva Temple has a Huge Deep Pond Known as Mukthi Theertham. Siva : Vataraneswaran – The Cosmic Ruler who resides in the banyan tree forest. (Vata – Banyan Tree , Aaranyam – Forest , Iswara – The Cosmic Ruler by whose will all Universes, in orderly cycles are created and Dissolved ). 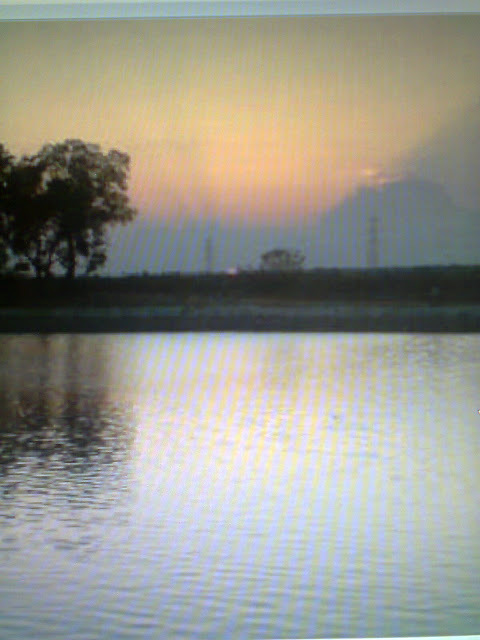 Sthala Vrisham : Banyan Tree (Vata Vriksham, Aala maram) , Jackfruit tree ( Palaa Maram). Thiru Aalangadu – The land of Banyan trees. 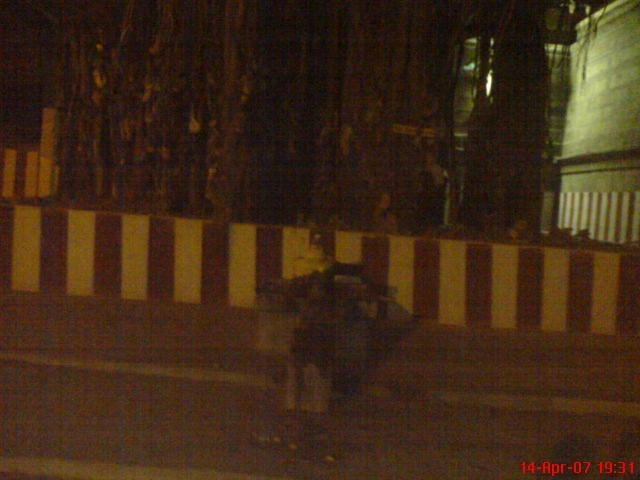 There is a Shiva linga under a Banyan Tree inside the temple.Banyan tree’s shade is said to bring peace of mind. Dakshinamurthy (An Avatar Of Siva) resides under the banyan tree blessing people so that they can discern right from wrong through gnana or Wisdom. A wise person has an equanimous nature and faces the challenges of life without fear. Nataraja – The Cosmic Lord of Dance (Natyam : Dance , Raja : ruler). The Upper right hand of Nataraja has the hour glass shaped Damaru Symbolising Creation. The Upper left hand of Nataraja has Agni or fire Symbolising destruction Of Evil. The other right hand has the Abhaya Hastha symbolising the Blessing the lord bestows on people so that they can discern good from evil. The other left hand is lifted above to symbolise Upliftment or salvation. The Lord dances on the Demon Apasmara symbolising the victory over ignorance and evil nature. As the Lord of Dance, Nataraja, Shiva performs the tandava, the dance in which the universe is created, maintained, and resolved. Shiva’s long, matted tresses, usually piled up in a knot, loosen during the dance and crash into the heavenly bodies, knocking them off course or destroying them utterly. The surrounding flames represent the manifest Universe. The snake swirling around his waist is Kundalini-Cosmic Energy inherent in all matter. The stoic face of Shiva represents his neutrality, thus being in balance. There is a Sculpture of Pancha Sabhas on top as we enter the Shiva Temple.Five siva temples house the five different halls of Dance. 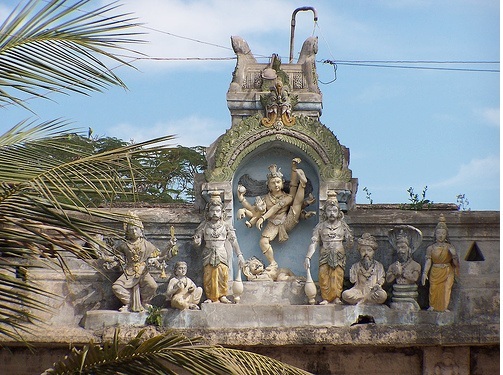 The Cosmic Lord dances uniquely in each place in Tamil Nadu.They are as follows. Kanaka Sabha ( The Hall Of Gold ) : Chidambaram temple. Velli Sabha ( The Hall Of Silver ) : Madurai Meenakshi Temple. Ratna Sabha ( The Hall Of Gems And Stones) : Thiru Aalangadu Temple. Thamira Sabha ( The Hall Of Copper ) : Tirunelveli Temple. Chitra Sabha (The Hall Of Artwork ) : Kutralam Kutralanathar Temple. Once there was a competition between Lord Siva and kali devi as to who was more superior. 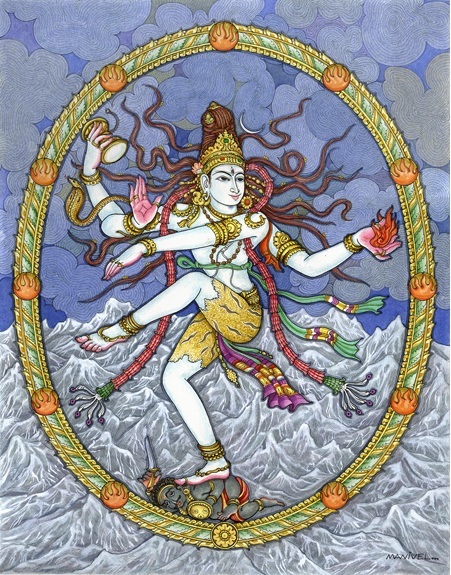 Shiva raises his foot above his head and dances, thus outwitting kali devi. As seen in the picture above Siva is flanked by dwara palakas on either side. Kali is seen on the left corner of the picture.Kaaraikal Ammaiyar is seen seated next to kali and sings in praise of Siva. Munchikesa maharishi is seen on the right side. There is a separate shrine for him in the street surrounding the Shiva Temple. Karkoodakan, the powerful Serpent (The person with the snake hood behind him) is seen worshipping the Lord Shiva. Sivagami, consort of Nataraja is also seen on the right most side. Sunandha maharshi has worshipped here. Inside the Temple premises there is a Sahasra Linga – A 1000 lingas integrated into a single form.There is a nandikeswara whose performs the Gayatri japa of the sahasra linga in front of it. Any kind of worship performed in front of the sahasra linga multiplies itself a 1000 times. There are the pancha bhoota lingas near it. 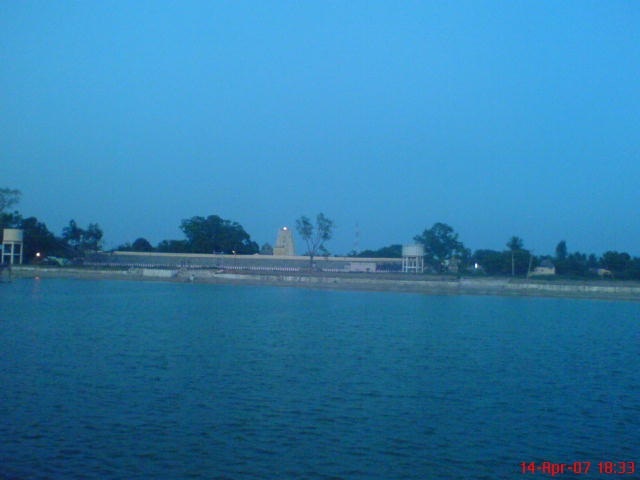 There is a Temple for Muktheswarar on the other Bank of Mukthi Theertham outside the Temple as seen in this photo below. The Small Mandapam houses the temple. 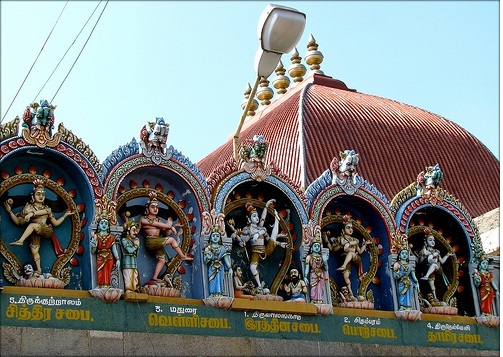 The Mandapam of the temple is an ancient one with beautiful sculptures in it’s numerous pillars. There are sculptures associated with the 12 rasis in this Temple.